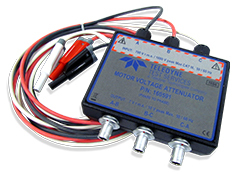 The Teledyne LeCroy Test Services (TLTS) Motor Voltage Attenuator (MVA) is used to measure motor voltages on 3-phase AC inductive motors. The MVA is designed to make phase-to-phase measurements. The system consists of three attenuators that convert high level AC voltages to low level signals that can be input to the QL3-FS system. The attenuators are housed in a rugged enclosure containing three sense cables with banana jack terminals that accept a variety of test probes.